Researchers at the University of Maryland were surprised and pleased to find that paper made of cellulose fibers is tougher and stronger the smaller the fibers get. Engineers have long sought a material that is both strong (resistant to non-recoverable deformation) and tough (tolerant of damage). "Strength and toughness are often exclusive to each other," said Teng Li, Associate Professor of Mechanical Engineering. "For example, a stronger material tends to be brittle, like cast iron or diamond." The UMD team has been pursuing the long-sought solution by exploring the mechanical properties of cellulose, the most abundant renewable bio-resource on Earth. They made papers with several sizes of cellulose fibers – all too small for the eye to see, ranging in size from about 30 micrometers to about 10 nanometers. Notebook paper is made of cellulose fibers a thousand times larger, and paper made of ten-nanometer-thick fibers was 40 times tougher and 130 times stronger. Cellulose fibers have many available hydrogen bonds, which are easily formed and broken, but they can also reform on their own—giving the material a 'self-healing' quality. The smaller the cellulose fibers, the more bonds per square area. This means they could both hold together better and re-form more quickly, the key for cellulose nanopaper to be both strong and tough. 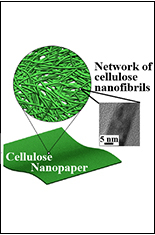 "It is helpful to know why cellulose nanopaper is both strong and tough, especially when the underlying reason is also applicable to many other materials," said Assistant Professor of Materials Science Liangbing Hu. Just to check, the researchers tried a similar experiment with carbon nanotubes, similar in size to the cellulose fibers. The carbon nanotubes had much weaker bonds holding them together, so under tension they held together less well and paper made of carbon nanotubes is weak, though such nanotubes are arguably the strongest material ever made. "The findings of this research could lead to a new class of high performance engineering materials that are both strong and tough, a Holy Grail in materials design," said Li. The research was published in the journal Proceedings of the National Academy of Sciences on July 6. The findings of this research could lead to a new class of high performance engineering materials that are both strong and tough, a Holy Grail in materials design.